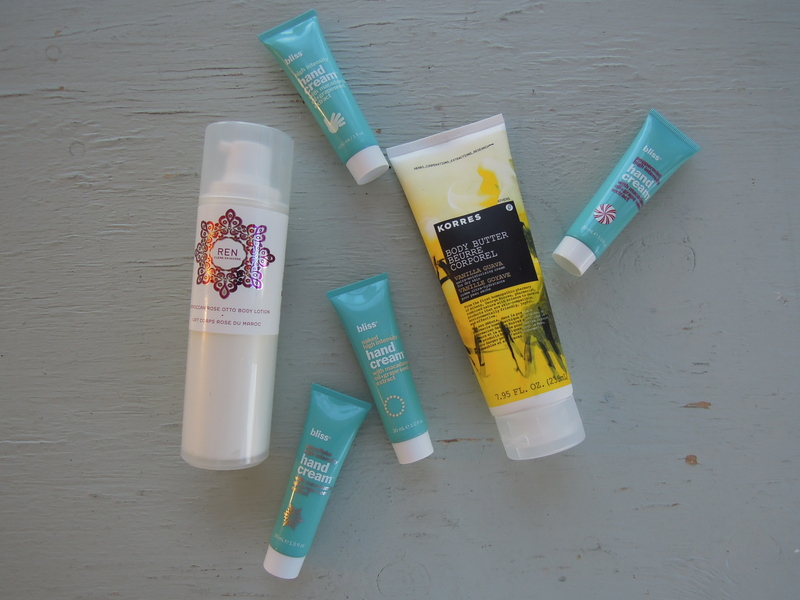 Hand and body lotions to try this Winter. My go to body lotion for the past few years has been the Desert Essence Fragrance Free Hand and Body Lotion which can be found at Whole Foods Supermarket. I can’t find a link for it, but it comes in a light blue bottle and I’m sure most employees there will help you find it. This is the most economical out of all the body lotions I use with a price of $8.99 which I still consider to be pricey. Sometimes when I run out of a bottle, I’ll branch out to try something new or different than my usual routine. The REN Moroccan Rose Otto Body Lotion sinks into your skin nicely with a soft fresh rose smell to it. While this does keep my skin moisturized, I’m not sure it’s worth the hefty price tag. I may be one of the few people that isn’t crazy about a rose smell. It’s okay, but to me the smell of Vanilla Guava is more fun to apply. That’s when KORRES Body Butter comes into play. I love the smell of this product and it sinks into your skin while leaving everything moisturized. The BLISS Hand Candy is a fun sample pack to purchase to sample different scents of bliss hand creams. I love these creams and like to apply the lotion at night and before bed. During the day I stick to one of my favorite hand lotions which is not pictured above. It’s the Supergoop SPF hand lotion. I take my sunscreen pretty seriously, so I love applying this lotion to my hands before commuting to and from work or even during the work day. My cubicle (so fancy) gets a lot of sunlight, so I like to protect my hands while I work too. What products do you use to keep your hands and body moisturized during the cold winter months? Desert Essence Fragrance Free Hand and Body Lotion available in person at Whole Foods Supermarket. REN Moroccan Rose Otto Body Lotion available here. KORRES Body Butter, Vanilla Guava available here. Supergoop SPF hand lotion available here. BLISS Hand Candy available here.